hi guys, its only a few weeks away till my wedding now and am slightly panicing, im getting married in greese and so am doing my own hair and make up.this isnt really a problem as im a hairdresser but think i maybe am a bit too old for the down and wavy look, its not my own hair as mine isnt long enough it is exstenions, and also not sure whether to have the side tiara or flowers, not getting married on a beach but in monistery gardens please help not sure what to do.!!!!!!!!!!!!!!!!!!!!!!!!!!!!!!!!!!!!!!!!!!!!!!!!!!!!!!!!!!!!!!!!!!!!!!!!!! oh and this is the back sorry they r so LARGE cant seem to reduce the size lol clueless!!!!!!!!!!!!!!!! You are definitely not too old - you look stunning! I think you should wear your hair like that.. Personally i think the flower in your hair looks best! It looks really lovely, very soft and feminine. I love the tiara too! Looks great - don't panic! You look fab, and definatly dont look old!! Another vote for the tiara. I am a 37 year old bride too and can sympathise with your wobbles. And then I saw your pics - you are stunning and do not look like mutton. Promise! I like both styles so I would say it depends on the dress and style you are aiming for. I think the flower would look great with a floaty dress for instance but if you are going for something more structured then the tiara. I think you can carry both looks though - you lucky thing! As a fellow 37 year old I can empathise with the age-appropriate worry but stop worrying you look amazing and fresh-faced. Cow! Only kidding, I love the flower but if you marry somewhere hot it might wilt very quickly, tiara is great prefer those two to the clip to be honest. When's the big day? You look fresh faced and very youthful. I would have put you at 30 at the very most. You look lovely, very pretty and natural. P.s can u do my hair and makeup please??? You look gorgeous and hair is lovely, very feminine! omg really confused now tiara or flowers and mrscarney2b the tiara was from a local wedding shop on sale £10 but took it to pieces and rearanged it on the side(see im never happy lol) thanks for all the replys feelin a bit more lamb now lol and thanks for all the 37 year olds replys guess were all in the same boat lol. i think they both look lovely, what is your dres like? you look gorgeous!! I think the flower is lovely but as a compromise you could wear the tiara for the service / day do then the flower in the evening for the party!! You look fabulous (speaking from someone who is 41!!!)!!! 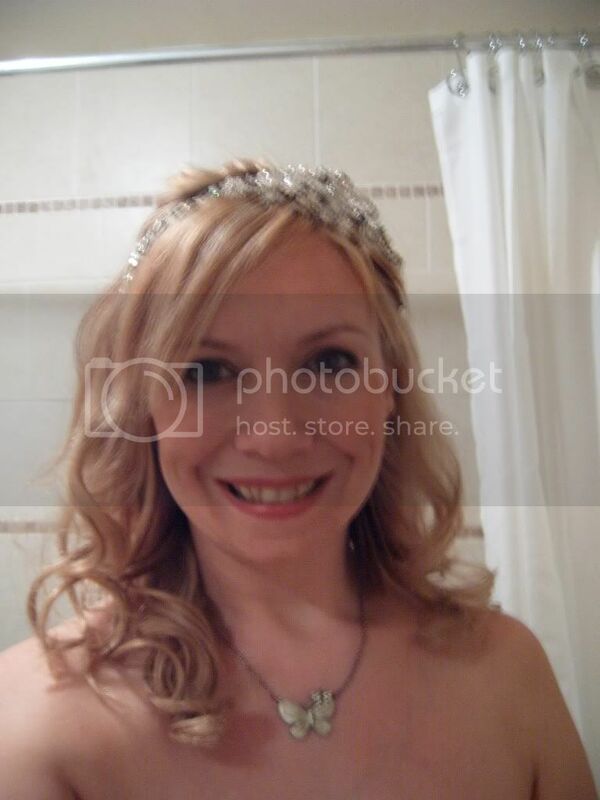 I think perhaps the tiara as well as the diamante clip (which I really like) may be a bit over kill. You definitely don't look too old. The only problem might be the curls wilting in the heat, I'm guessing it'll still be pretty hot in Greece. I vote for the flower, but then I'm not really a tiara girl. I was expecting someone ancient! 37 is young! And you look young too. Congratulations! Think the photos look great. 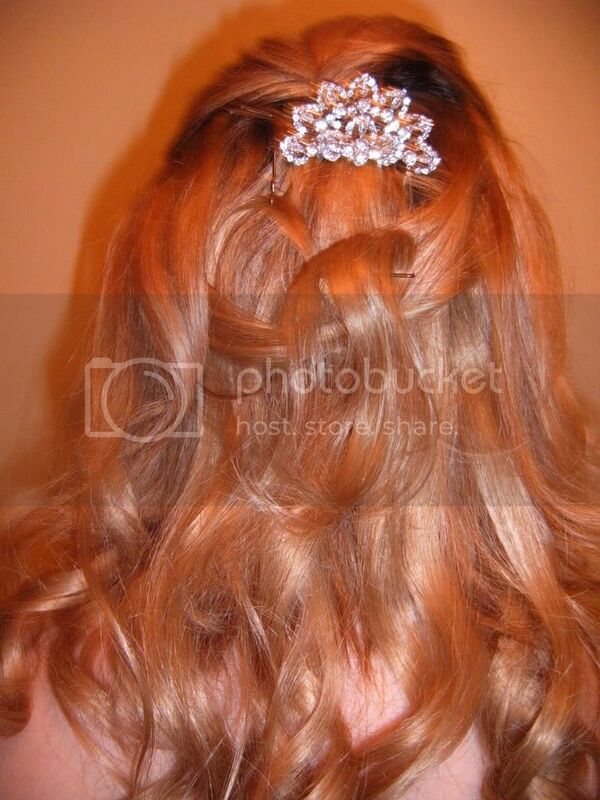 Why not have the flower for the day/ceremony, and then change to the tiara for the evening. I had a birdcage veil and a tiara, didn't want to wear them at the same time, so I had the birdcage veil for the ceremony and afternoon, and then the sidespray tiara for the supper/evening.